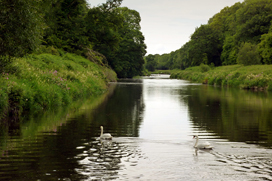 The River Slaney is a wide strong flowing river punctuated with slower flowing areas and pools in some stretches. The river between Enniscorthy and Bunclody is wide and fast flowing. From Bunclody to Tullow the banks are generally clear and the river is wide, with a strong fast current. However, there are a good number of weirs punctuated by pools with some slower flowing areas. The stretch from Tullow to Baltinglass is fast flowing, rocky and overgrown in parts. 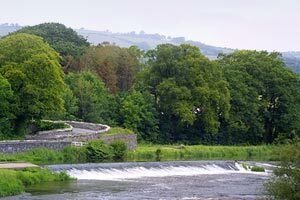 In the Co Wicklow stretch of the Slaney north of Tullow, brown trout is the dominant species. The River Barrow shares a common estuary with the Rivers Nore and Suir, they are known as the ‘Three Sisters’. The Barrow is a more gently flowing river and has been made navigable by building canals round the shallow areas, and therefore best fishing areas are downstream of the weirs that divert the waters to the canals. Because the Barrow is a slower and deeper river than the others, the distribution of its trout stock differs significantly. Therefore the best numbers can be found in the vicinity of the shallower water downstream of the weirs.